Westford, MA (July 26, 2010) – We don’t know about you, but our football fever has yet to subside. On the heels of the biggest soccer event in the world, sportlifestyle brand PUMA® is excited to announce a new initiative that links women’s soccer with a well-deserving cause: launching this month, PUMA’s Project Pink will strive to raise awareness — and funds — in support of the fight against breast cancer. In conjunction with their partnership with Women’s Professional Soccer (WPS), PUMA will outfit some of the best female players in the world in special Project Pink kits for five WPS matches. The brand has also created a range of Project Pink merchandise that will be available for purchase beginning this summer and continuing through Breast Cancer Awareness Month in October. Profits from the sale of PUMA’s Project Pink gear will be donated to a nonprofit committed to breast cancer awareness or research; the beneficiary will be named as the result of a national online voting campaign. It’s not all about us, though. In true PUMA fashion, with an eye on both engaging and empowering the female soccer community, the brand is giving consumers a voice. Launching July 31, PUMA is hosting a forum at wps.pumafootball.com/projectpink that invites interaction with the Project Pink initiative. The site allows for the nomination of breast cancer charities with nonprofit status; supporters can then log on to vote for the winner, who will ultimately receive a donation consisting of 100% of the profits from the sale of PUMA Project Pink product. The nomination period will open on August 7; voting will begin on September 13. The crowd favorite will be announced and the donation made in late October. WPS teams including the Boston Breakers, Washington Freedom, FC Gold Pride, Philadelphia Independence, and Sky Blue FC have joined with PUMA to rally behind Project Pink, designating matches in July and August to help raise awareness for the cause. Players from each home team will sport special Project Pink kits developed by PUMA, and PUMA’s Project Pink match ball will be utilized throughout each game. Project Pink-themed activities will also be hosted in pre-game Fanzones and throughout the matches. WPS teams the Atlanta Beat and Chicago Red Stars will also support Project Pink with events later in the season. In line with the first match, PUMA’s new range of Project Pink merchandise is set to debut on July 26 on shop.puma.com and at select PUMA Stores and other retail partners. It will also be sold at participating stadiums during WPS games throughout the season. Allowing soccer fans and novice athletes to show their support alongside their favorite players, PUMA’s Project Pink replica jersey, tee-shirts in pink and white, trainer and (mini) skill ball, and gym sack will all be available for purchase. In an effort to drive additional awareness to the cause, the brand will be using the Twitter hash tag #projectpink when communicating updates about Project Pink and will also encourage fans creating content to do the same. For every tweet using the hash tag from July 31 through October 18, PUMA will donate an additional $1 to the Project Pink cause, up to a maximum of $25,000. PUMA will count one tweet using the hash tag per user per day. PUMA became an official founding partner of WPS and an official sponsor of all WPS franchises in December 2008. The multi-year partnership makes PUMA the official sport and lifestyle apparel, footwear and equipment supplier of WPS, including the official WPS Match Ball; PUMA is also the official supplier of PUMA WPS Fanwear. PUMA’s roster of WPS athletes includes four-time FIFA World Player of the Year, Marta, as well as Natasha Kai, Leslie Osborne, Amy Rodriguez, Karina LeBlanc, and Alex Scott. On a global scale, PUMA Football’s portfolio includes five European National Teams, including Italy, Austria, Switzerland, Bulgaria and Czech Republic, 2010 FIFA World Cup™ contenders Uruguay, and 13 African soccer Federations including the current CAF African Cup of Nations™ holders Egypt, Algeria, Ghana, Cameroon, and Ivory Coast. PUMA also sponsors men’s soccer players including Jay Demerit, Brian Ching, Heath Pearce, Dwayne De Rosario, Matt Reis, and Kasey Keller. 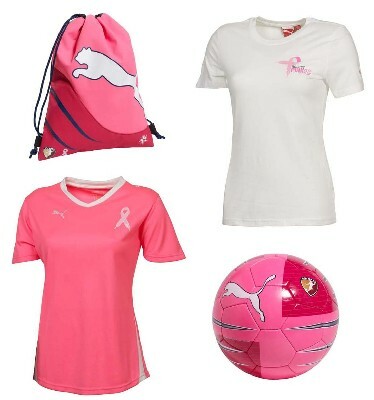 For more information about Project Pink and PUMA’s partnership with WPS, visit wps.pumafootball.com. Just in time for Valentine’s Day, Puma has released an e-card for the soccer fan. When weeks of negotiations fell through, the WPS shut down the LA Sol. The 19 players held by the Sol will selected during a draft February 4. The first ever “Human Foosball Tournament” will begin on October 10th, 2009 in Canada. The Tournament is the kick-off for Puma’s “Love = Football” promotion.